Do you want to make your beard look like the beard of the gods? Do you want to grow your beard, add shine or simply mold your beard? Or you just want to properly maintain your beard? The Hercules Beard Care Kit will provide you with nine tools to ensure that grooming, maintaining and growing a healthy beard is not a task for Titans! Beard Oil; will help you to maintain moisture in your beard, even in hot dry environments. Beard Balm; a truly magical product that, in addition to conditioning, boosting growth and sealing in moisture, will turn you into a bearded wizard! Beard Shampoo; formulated to keep your facial hair and stubble clean and fresh. Razor; will help you tackle those patchy, uneven spots with ease. Scissors; the inseparable friend of an imposing beard will, thanks to their sharp precision blades, hold and cut coarse beard hair with great ease. Beard Brush; is the perfect tool when it comes to making your beard neat and looking it’s best. Beard Comb; whose thick teeth are designed to really comb and unknit a beard of any density (whilst also usable with your head hair!). Shape Comb; will allow you to style your beard to perfection, without the risk of making mistakes. Travel Bag; will make everything easier for you when you need to travel or carry on your kit to work. Plus a Secret Gift; inside the kit. SATISFACTION GUARANTEE: our Beard Kit is approved by the goods and backed by our manufacturer 30-day money back guarantee. BUY IT NOW AND START LOOKING LIKE A GOD. HERCULES BEARD KIT; Includes 9 items specially built for all men’s, refreshing beard wash shampoo, organic oil with the essentials ingredients to healthy grow the beard, the perfect beard balm to shape and help maintain a perfect beard. 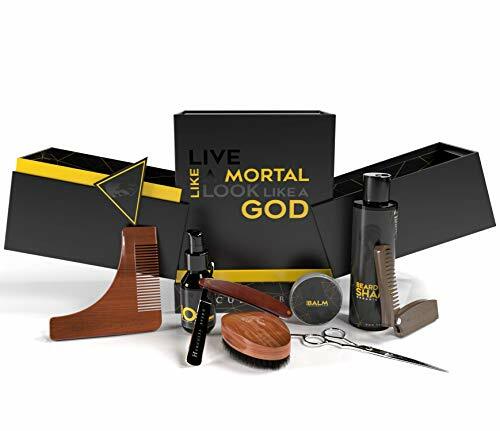 IS THE PERFECT GIFT; Even if you don’t have a beard, this Beard Grooming Kit for Men makes a perfect gift for your bearded friends and family; The box itself make the kit stand out as a special edition with engraved messages and some surprises gift inside the kit. LIDER QUALITY BEARD GROOMING TOOLS; A man’s beard is the most important asset of masculinity, Hercules Beard provides you with the best tools to keep your beard looking amazing, Our stainless-steel barber scissors are designed with a man’s beard in mind, The travel wood comb won’t snag or pull hair like cheaper plastic combs, the shape comb will help to get the perfect shape, our razor is created with the best material to last for years.